Tuesday, February 26, 2019, 4:30 to 6:00 p.m.
More than an abstract concept or controversial topic, privilege is a set of practices and ideologies that pervade our lived experiences. We hope to unpack what privilege is, how it manifests, and its impact through a conversation with Professor James Davis (Middlebury College, Religion Department) and Professor Errol Henderson (Penn State University, Political Science). Both scholars have approached the topic of privilege from a number of vantage points but this discussion will focus on privilege in the academy, at Middlebury and beyond. Atwater Dining Hall Dinner immediately following. Free and open to the public. Sponsored by Rohatyn Center for Global and International Affairs; Center for the Comparative Study of Race and Ethnicity; Center for Creativity, Innovation, and Social Entrepreneurship. This workshop will explore an understanding of the idea that goes beyond resigned tolerance. Together, we will consider the virtues that contribute to forbearance, as well as how forbearance reshapes other important Christian commitments, like the defense of truth, the pursuit of justice, and our public witness to the faith. Since the 2016 presidential campaign, many pundits have lamented the death of anything that resembles civility in American politics. But other observers argue that the idea of civility is unproductive or even dangerous, because it demands that we minimize our differences in the name of public nicety. In this talk, we will consider what it means to talk of civility as something more than politeness, but rather as a set of moral norms for political culture that is compatible with the honest negotiation of difference—and with social protest. We also will explore the potential for religious communities to serve as “schools of civility” for the larger society. 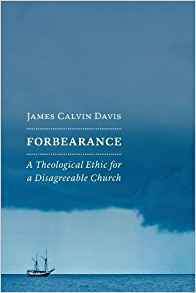 Thursday, March 1, 2018 at 6:00 p.m.
Come participate in a book signing and discussion with James Calvin Davis. Books will be available to purchase from the Vermont Book Shop, and light refreshments will be served!